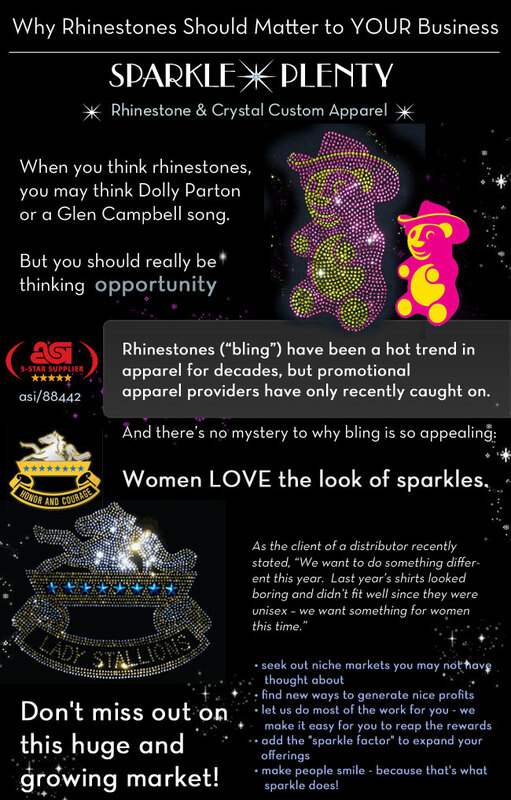 As seen in our ASI blitz, we’re sending out our e-guide, Why Rhinestones Should Matter to Your Business about adding bling (& $$$) to your promo biz – if you’d like ro receive a complimentary copy, please email us at info@sparkle-plenty.com w/ “BLING GUIDE” in the subject line. 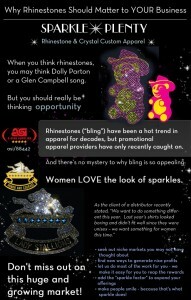 Sparkle Plenty Designs ASI/88442 (An ASI 5-STAR Decorator/Supplier) specializes in creating custom Swarovski crystal or sparkling rhinestone logo-wear and apparel (or any time of year) they give a glam! This entry was posted in add bling, add bling to your business, ASI, ASI/88442, custom apparel, custom logo shirts, fundraising shirts, rhinestone business, rhinestone tees, sparkle plenty designs, sparkly rhinestone shirts, staff apparel, Swarovksi Crystal Shirts, Uncategorized. Bookmark the permalink.